Best served chilled. Shake well before serving. Ingredients: Water, Lychee Juice From Concentrate (25%), Nata De Coco (Coconut Gel) Pieces (25%), Sugar, Fructose, Citric Acid, Stabiliser (Xanthan Gum), Flavourings, Preservative (Potassium Sorbate, Sodium Benzoate), Colours (Allura Red). 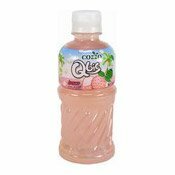 Simply enter your details below and we will send you an e-mail when “Qbic Lychee Juice Drink With Nata De Coco (荔枝果汁爽)” is back in stock!